On November 1, 2011 Manitoba Conservation Environmental Assessment & Licensing Branch (EALB) received a new proposal from Sun Gro Horticulture Canada Ltd. for an Environment Act license to harvest peat inside Hecla/Grindstone Provincial Park. 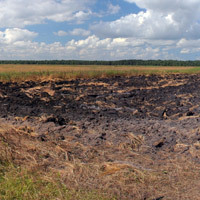 The approximately 531 ha targeted peatland is located approximately 21 km northeast of Riverton, MB. Public comments will be accepted until January 16, 2012. The Government of Manitoba enacted Save Lake Winnipeg Act June 16 2011, which placed a two-year moratorium on the granting of quarry licences and quarry permits for peat and peat moss under Manitoba's Mines and Minerals Act. Three Environment Act licenses for peat mines have been granted in Manitoba since passage of Save Lake Winnipeg Act on June 16, 2011. The current Sun Gro application and review is the first time an Environment Act license has been requested following the passage of Save Lake Winnipeg Act. "Potentially permitting peat mines inside a provincial park, less than six months after a moratorium on new peat quarry licenses and permits, is contradictory to the aims of Save Lake Winnipeg Act. How many other peat mines could become operational in Manitoba on the basis of historical Mines and Minerals Act licenses and permits?" questioned Manitoba Wildlands Director Gaile Whelan Enns.